Funeral directors and embalmers can register for Teamsters Local 727’s continuing education seminar, which will be held noon-6 p.m., Wednesday, July 13 at the local union’s meeting hall in Park Ridge. The Teamsters Local 727 Bargaining Committee made it clear during negotiations with SCI management last week that narrowing the focus of bargaining is the only way to make real progress on a new contract for funeral directors, embalmers and drivers. 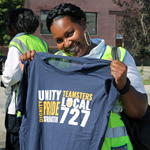 Teamsters Local 727 representatives recently won several grievances against Cook DuPage Transportation management and have numerous others slated for arbitration.